The 1982 Pittsburgh Steelers saw the team return to the playoffs after a two-year hiatus. 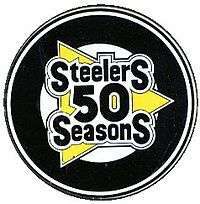 This was also the Steelers 50th Anniversary season. Although the season was shortened as a result of the 1982 strike, the Steelers finished a strong 6–3 record, good enough for fourth in the AFC as a whole. Although division standings were thrown out as a result of the strike, the Steelers unofficially finished second in the AFC Central, one game behind defending AFC Champion Cincinnati. The 1982 season is best remembered as the final seasons for Hall of Famers Lynn Swann and Jack Ham and the "unofficial" final season of fellow Hall of Famer Terry Bradshaw, who would miss much of the 1983 season due to injuries before retiring. On the flip side, it would also be the first year of future Hall of Fame placekicker Gary Anderson and the first year of the team using a 3-4 defense, a style still used by the team as of 2013. The 1982 offseason was the start of a slow transition period for the team, as the defensive line was hit with key retirements in "Mean Joe" Greene and L. C. Greenwood. Partially due to the team losing two key players and partially due to the need to go up against a more wide-open NFL, head coach Chuck Noll switched from the traditional 4–3 defensive alignment (four lineman & three linebackers) to the 3–4 (three lineman & four linebackers). The Steelers would more than make a good transition to the 3–4, as many teams have since tried to copy the Steelers success with the 3–4 alignment, especially since 2001, when the Steelers were the only team in the NFL with the alignment but led the league in defense. 1982 did see the Steelers sign a rookie placekicker from Syracuse named Gary Anderson, claiming him off waivers from Buffalo just before the start of the season. Anderson would stay in Pittsburgh for the next 13 season and play an additional 10 with four other teams to become the Steelers' all-time leading scorer. He retired after the 2004 season as the NFL's all-time leading scorer, a record since surpassed by Morten Andersen. Cancelled due to player's strike. Postponed due to player's strike. This playoff game against the Chargers, played on Jan. 9, 1983 at Three Rivers Stadium, will go down in history as one of the greatest games of Bradshaw’s Hall of Fame career as well as one of the most bitter defeats in franchise history. In 1979, the San Diego Chargers went into the AFC Playoffs as the No. 1 seed, but a loss to the Houston Oilers in the Divisional Round prevented them from even getting a shot at the Steelers in the AFC Championship Game. In 1981 the Chargers had made that step, but they lost in Cincinnati in a game played in temperatures even polar bears would consider on the chilly side. The 1982 San Diego Chargers were still explosive offensively, having ranked No. 1 in the NFL in points scored and passing yards, while their defense depended upon sacks (19) and takeaways (25) during the course of the nine-game regular season. These Chargers finished with the same 6-3 record as the Steelers, but they entered the AFC Tournament having won five of their previous six games. The game opened with Steelers linebacker Guy Ruff recovering a Chargers fumble of the opening kickoff in the end zone for a quick touchdown, and then for the next three-and-a-half quarters the game belonged to Bradshaw. At one point he completed 15 passes in a row, and he finished the game with 28 completions in 39 attempts for 335 yards, with two touchdowns. But Bradshaw also threw two interceptions, the second of which served as a turning point in the game. In the moments just before that turnover, the Steelers were holding a 28-17 lead with 11 minutes remaining in a game of which they were in complete control. Facing a third down situation, Bradshaw dropped back to pass, and after he escaped the contain of the Chargers pass rush he had a clear path to run for the first down. But instead of running, Bradshaw tried to depend on his right arm once again, but this time the pass was intercepted by Jeff Allen and returned to the Steelers 29-yard line. In another of the examples of the 1982 Steelers defense being more opportunistic than impregnable, Mel Blount answered with an interception of Dan Fouts, but the play was nullified by a holding penalty on the Steelers. With new life, Fouts moved the Chargers offense down the field for a touchdown that came on an 8-yard pass to tight end Kellen Winslow and closed the Steelers’ lead to 28-24. On their ensuing offensive possession, the Steelers offense was able to grind out a couple of first downs to get close to midfield before John Goodson had to come on to punt. But instead of pinning the Chargers deep, Goodson, a barefoot punter, shanked one for only 20 yards to the Chargers 36-yard line. Fouts moved the offense down the field methodically, and with one minute to play, he threw a 2-yard touchdown pass to Winslow, and the Steelers had been eliminated from the Tournament, 31-28. ↑ 1982 Pittsburgh Steelers Media Guide. ↑ 1983 Pittsburgh Steelers Media Guide. ↑ "1982 Pittsburgh Steelers". Pro-Football-Reference.com. Retrieved December 11, 2014.